The first qualifier of Tournament of Legends III will happen this weekend at Winter Brawl! (February 23-25). The tournament will be streamed on Atari‘s twitch channel. Free Play Arcade made a very good mini documentary that goes through all the versions of SF2 and finally talks about the competitive scene of ST. This serves as a good preview and marketing of the huge tournament that will be run in March at Free Play Arlington. The anticipated FT10 match between Otochun and Teppei took place this past weekend in Osaka (Kansai). The stream video also contains several FT5 exhibitions afterwards plus some more commented casuals between top players. Separated videos for each match will be posted soon on the X-Count project youtube channel. Daigo announced that the second ST Kemonomichi FT10 series will be between Kotaka Shoten and Ito DJ, one of the best players in the scene. You can see the official announcement which also contains some interesting interviews that give more details about Ito‘s story and background. Long set of 20 minutes between Yaya Sagat and Shu Ken. It was probably played after last week tournament at Matmouse. An hour and a half (!) set between VIPER Hawk and Munari Sagat. However, they use their pocket characters to make the classic Guile vs Ryu battle. The set took place at Game Newton Ooyama arcade. Xgamerz realized there are a lot of these long sets between players buried in the streams. Sometimes they leave the stream on after the tournaments and then it’s when these sets happen. So he started searching if he could find more of these gems in old footage. This week he found a long set of 30 minutes between Tomoza Dictator and Souzou FeiLong, the best FeiLong on the planet, now inactive. For those wondering how this matchup goes it’s supposed to be 6-4 in Dictator’s favor. The fight happened back in 2015 and was played at Gamespot Versus. The Danisen series at Gamespot Versus are back! (Kanto) They run from 2010 to 2013. 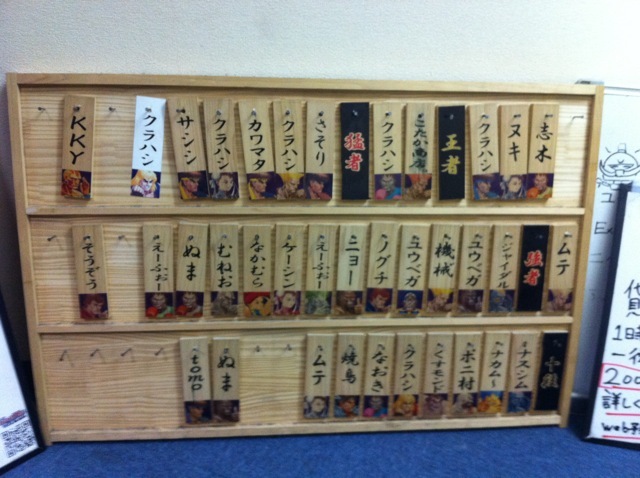 Many people remember the popular wooden board of the rankings located at the entrance of the arcade. Now in 2018 they started again including all the new players that have become usual ones in the last years. Videos with full annotations: Part 1, Part 2, Part 3, Part 4. Special tournament at Kawachieiwa Enpara arcade in Osaka (Kansai). Not sure if this is part of the monthly ranking battle or not. “Winner stays on” format with 2 laps. However, for the playoffs they use some sort of ratio points shown in the description. Most of the big names in Osaka are present. The final is between Gunze Zangief (with an amazing performance throughout the tournament) and Otochun (using Honda). Gamespot Versus special tournament (Kanto). If you thought that Japanese have the most creative tournament formats (or the most silly ones) wait to hear this one: double elimination, whoever wins the match LOSES! Yes, you read it right. So the grand final was between the two only players who never won a match: Nemo vs ToneP. North vs South tournament from the HL-SEGA arcade (Kansai) by Shogatsu. Kusumondo Honda and Tsuji Boxer are defending their teams in the final. Warning, the audio is all messed up. Game Daytona Shiki weekly tournament (Kanto). With their usual “winner stays on” format. There are always 2 laps. Players usually play one lap with their main and another one with their alt character. The known American Gaijin XSPR Ryu has an awesome performance as he did few months ago. This time he makes a long streak to put him in the final against Koemon FeiLong. Game Newton Ooyama special tournament (Kanto) with 10 of the known strong players in Tokyo forming two teams for a 5vs5 battle. First Attack run their 5th ranking battle on Saturday. Videos and results will be posted soon. Atari posted another video of the Dublo7 (aka David Spence) archive project. This second video contains footage recorded at the B5 (pre-EVO) tournament in 2001. It has the 4 big names of the old school in the US: AfroCole, John Choi, Alex Valle and Mike Watson. As every Monday, Fudd DJ posted another #STNotW (ST Normal of the Week) write up on the Free Play Arcade group. This week he goes through Blanka’s st.lk or “crab kick”. The legendary commentator and Cammy player James Chen was interviewed by fighter101 recently and it was all published this week. A really good read with many details and anecdotes of ST and the FGC. For those who are lucky enough to be able to read Japanese, there is a resource made by Gambiko who posts very detailed write ups about ST matchups and strategies every other day (!). He started around 5 months ago but it’s never late to feature great resources like this with so much content.